The Los Angeles Dodgers snap an 11-game Major League Baseball skid, clinching a playoff berth with a 5-3 victory over the San Francisco Giants. Clayton Kershaw of the Los Angeles Dodgers pitches against the San Francisco Giants in the third inning of their MLB game at AT&T Park in San Francisco, California, on September 12, 2017. The Dodgers won 5-3. Mired in an 11-game losing streak, Clayton Kershaw and the Los Angeles Dodgers felt the magnitude of this regular-season game more than most. And understandably so, the way September has gone so far. Kershaw pitched the Dodgers to their first win in nearly two weeks, helping them clinch a playoff berth by finally beating the San Francisco Giants 5-3 on Tuesday night to snap the club's longest losing streak since moving to the West Coast in 1958. "We needed it," manager Dave Roberts said. "We were scratching and clawing to get that W."
The Dodgers' slide was their worst in 25 years, topping 10-game skids in Los Angeles during the 1961 and 1992 seasons. The 1944 Brooklyn team lost 16 straight games. Despite the recent tailspin, Los Angeles still owns the best record in the majors at 93-52. The National League West leaders secured at least the second NL wildcard and joined the NL East champions Washington Nationals as the only teams to punch their postseason tickets so far. "A lot of relief in that clubhouse," Roberts said. "Usually there's handshakes but tonight there were more hugs. Playing it cool went to the side tonight. I think it was warranted." Kershaw (17-3) tied Milwaukee's Zach Davies for the major league lead in wins. Kenley Jansen got four outs for his 37th save but allowed three straight singles with one out in the ninth to face a bases-loaded jam. He struck out Buster Posey and Nick Hundley to end it. Los Angeles catcher Yasmani Grandal pumped his right fist and Jansen pounded his chest as the Dodgers hustled out of their dugout. "He's the best in the league for a reason. 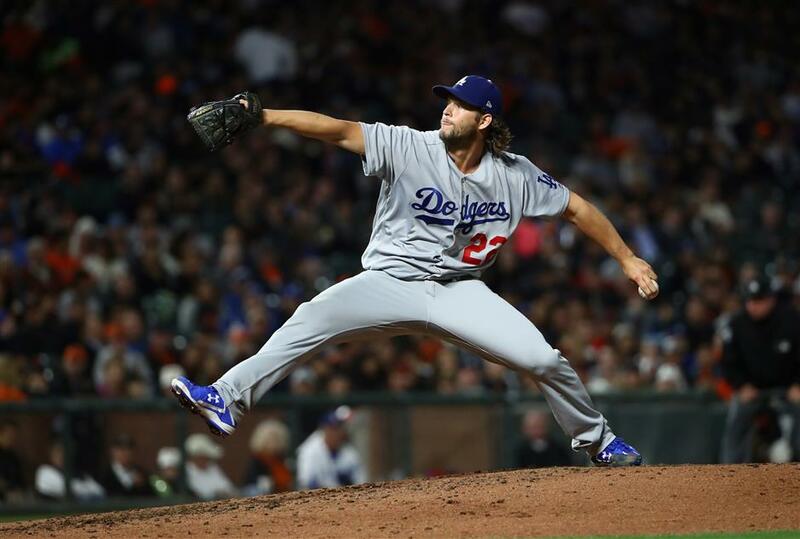 He got it done," Kershaw said of the Dodgers' closer. "Tonight wasn't easy. Nothing about these past two weeks has been easy so we shouldn't have expected this one to be easy. ... We needed everybody to get a win tonight. It took just about everybody. More just a sense of relief now that we got a win. We can't let up. Every time the losses keep mounting and mounting it gets that much harder to win a game." Justin Turner hit a key RBI double in the eighth and Chase Utley homered leading off the fourth, splashing into the water of McCovey Cove beyond the right-field wall for the first time in his career — the 41st ever by an opposing hitter. Neither team took batting practice on the field after playing past 2am because of two delays for lightning and rain on Monday. Los Angeles, which won for just the second time in 18 games and first since topping San Diego on September 1, holds a 4 1/2-game lead over Washington for best record in the NL after the Nationals lost 0-8 to the Atlanta Braves. The teams meet this weekend in DC. "Making the postseason's no small feat," Kershaw said. "Can't take that for granted, but from where we've been we want home field, we want the division, we want home field throughout the World Series. We have a lot of things to keep going for." Kershaw followed Utley's homer with a double and Corey Seager put the Dodgers ahead on a sacrifice fly. Yasiel Puig's two-run double chased Johnny Cueto, who had intentionally walked Cody Bellinger to bring up Puig. Kelby Tomlinson homered leading off the third against Kershaw, who struck out six over six innings. He allowed eight hits and two runs. The left-hander struck out pinch-hitter Tim Federowicz to end the sixth with the bases loaded after Orlando Calixte's sacrifice fly. Kershaw is 21-9 with a 1.62 ERA in 40 career games and 39 starts against San Francisco and he improved to 7-1 in nine 2017 road starts. Kershaw had a limit of 100 pitches in his third start since returning from a lower back strain — and he was efficient, his night done instead after 91. Cueto (7-8) struck out eight over 3 2/3 innings, allowing four runs and six hits with four walks in his third start since coming off the disabled list. The Dodgers elevated the right-hander's pitch count in a hurry, with Cueto throwing 77 through three. But he struck out Grandal as Los Angeles left the bases loaded and stranded runners in scoring position in each of the first three innings. Then, the Dodgers got going in the fourth.